After over two years from the event, we can still hear today the echoes of that memorable Italian progressive rock night. That Saturday 6th November 2010 the same Locanda delle Fate went first on stage, playing their masterpiece “Forse le lucciole non si amano più” almost in its entirety, adding the then-unreleased songs “Sequenza circolare” and “La giostra”, later included in the recent “The missing fireflies” (2012). 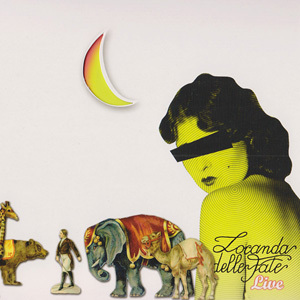 Locanda delle Fate’s today line-up includes four original members – Leonardo Sasso (vocals), Oscar Mazzoglio (keyboards), Luciano Boero (bass guitar) and Giorgio Gardino (drums). Once available only as vinyl, “Live in Bloom” is here reissued on CD/DVD; the first 1000 copies come in a special lavish format, comprising a hard-cover mini-booklet inside a horizontal slipcase (15 x 25cm). Compared to its previous release, this edition finally contains, both on the CD and the DVD, the entire Locanda delle Fate’s concert, which could not be included as a whole in the space of a single LP. The sound quality is excellent, and the visual part has been professionally recorded with a 4-cam system. To sum it all, this is a release not to be missed by Italian prog fanatics, especially who was present during that Progvention 2010 night, and also an important document that testimonies how the genre is still today very much alive!